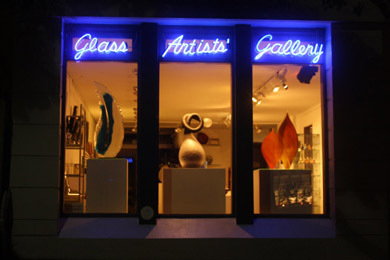 The Glass Artists’ Gallery is located in Glebe Point Road, Glebe. Glebe is renowned for its village atmosphere where students, artists and business people all rub shoulders harmoniously. As a busy inner-city suburb of Sydney, Glebe is situated near the gardens of Victoria Park, the Seymour Theatre Centre and is in the university precincts of University of Sydney, Notre Dame and UTS. Glebe Point Road is full of restaurants, galleries and famous bookstores for you to enjoy. The Gallery is easily accessible from the city, Eastern Suburbs, the North Shore and the West. It is only fifteen minutes by car or bus from the CBD. Access by bus: Routes 431 and 433 from the city / Central and Route 370 from the Eastern Suburbs, travel along Glebe Point Road Getting out at the Glebe Public School and heading west, the Gallery is 20 meters down the road. Though any bus traveling down Broadway/Parramatta Road or to the University of Sydney will get you to the Gallery. Getting off at the Broadway Shopping Centre and heading west will bring you to Glebe Point Road. The Gallery is on the western side of the road, three blocks down.